The SHA has notified the towns of Brentwood and Mount Rainier that they will be removing the school zone signage on US1 (Rhode Island Avenue) near 37th street where two "school zone" speed cameras were placed. The Montessori school for which the school zone was marked in April 2010 was recently moved out of its Mount Rainier location to a new location in DC. Each town controlled one of the two cameras. we had previously reported that the section of road where these cameras are located was previously posted at 35mph but was re-posted as 25mph shortly before the cameras were deployed. The exact number of violations issued by these cameras is unknown at this time, but Mount Rainier's FY12 budget shows that in the 8 months from 7/1/2010-2/282011/ the town received $1,087,591 in total speed camera revenue. This is equal to at least 27,189 citations in 8 months. For comparison Mount Rainier has a population of about 8,500 and a total FY12 budget of $4.6million. StopBigBrotherMD.org received to reply from either town in response to our questions about the change and how many citations had been issued since the school moved. While we have no specific information indicating that either the towns or the SHA were aware of the school's move before mid July, drivers who received citations from either camera in July 2011 or later and have not yet paid might consider contesting citations on the grounds that the school was no longer present. 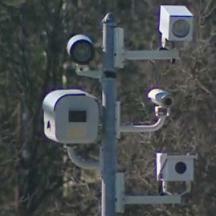 There are still other speed camera sites on US 1 farther north in College Park.